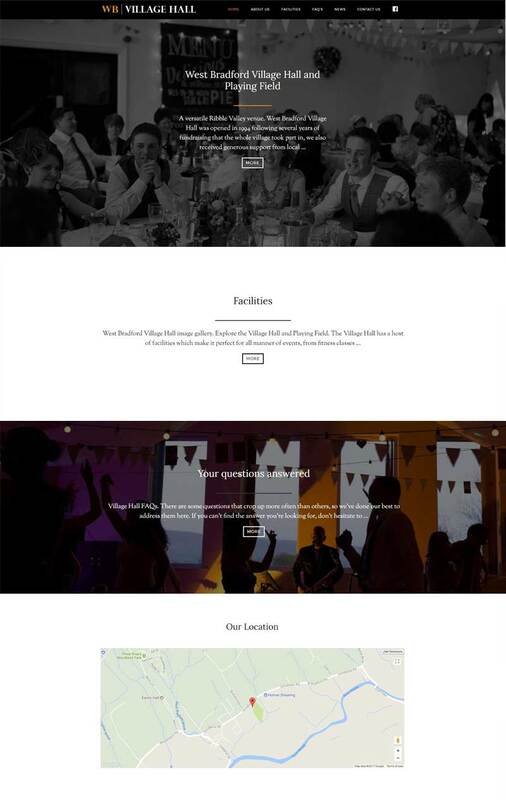 The site is was a local village hall wanting to showcase the facilities they provide whilst showing off the beautiful location. West Bradford Village Hall and Playing Field, a versatile Ribble Valley venue. West Bradford Village Hall was opened in 1994 following several years of fundraising that the whole village took part in, we also received generous support from local grant bodies. With a large car park, expansive playing field and a popular children’s play park outside, West Bradford Village Hall is a valued facility for the village. This community hall is proving more and more popular as a venue for parties, weddings, concerts and more, thanks to its light and airy atmosphere, spacious dimensions, easy access for those with limited mobility, and well-equipped kitchen. In 2014, the hall was extended and refurbished with a bigger kitchen, extended lounge area, repositioned bar, and new windows in the main hall to take advantage of a great view of Pendle Hill.